An oatmeal mask is great for your skin. 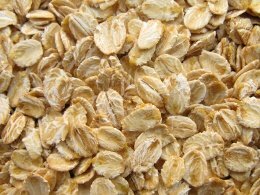 Oatmeal possesses some wonderful skin care properties for oily, dry, or sensitive skin. It is a gentle and effective natural skin cleanser and removes surface dirt and impurities. It restores the skin’s natural moisture balance by protecting the skin from water loss and drawing moisture to the skin from the surroundings. It is a gentle facial scrub and skin exfoliant. It soothes the skin and eases the discomfort of skin irritations caused by rashes, abrasions, insect bites, poison ivy, poison oak, poison sumac, etc. It provides relief from skin itch and skin redness. Listed below are some oatmeal facials recipes. Always spot test the mask first to ensure the ingredients will not irritate the skin. Mix all of the above ingredients together and store the mixture in an airtight container. For use of this oatmeal facial mask, take about one to two tablespoons of the mask mixture and add enough distilled water to achieve a paste-like consistency and then apply it to the face. Combine the ingredients together until all is well mixed and then spread the mixture on the face. The mask should be left on the face until dry or for at least 20 minutes. Massage the face with the dry oatmeal and then rinse it off with warm water. Next, apply the banana and yogurt mixture evenly on the face. Leave the facial mask on for about 20 minutes and then rinse off the paste with warm clean water. Mash the ripe banana, add the cup of oatmeal to it, and mix well. Add enough milk to create a nice paste. Apply the oatmeal and banana paste to the face and leave it on for approximately 10 to 15 minutes. This is a very simple facial mask. Take some oatmeal and add enough water to create a creamy paste. Apply to the face and let it dry completely. Once dry, remove the facial mask by very gently rubbing off the oatmeal with your fingers.